Teaching and learning frameworks are research-informed models for course design that help instructors align learning goals with classroom activities, create motivating and inclusive environments, and integrate assessment into learning. Frameworks like Backward Design serve as conceptual maps for planning or revising any course, syllabus, or lesson, and can be easily adapted and mixed. Teaching and learning frameworks provide scaffolded, diverse approaches that help students “form knowledge structures that are accurately and meaningfully organized” while informing “when and how to apply the skills and knowledge they learn” (Ambrose et. al., 4-5). Eschewing “Instruction,” which focuses on content delivery, “Learning” focuses on structures for continual student development, inviting students to be “co-producers” in the classroom (Barr and Tagg, 15). This page provides an overview of major teaching and learning frameworks, from theoretical and methodological approaches for overall course design to specific techniques for individual class sessions. 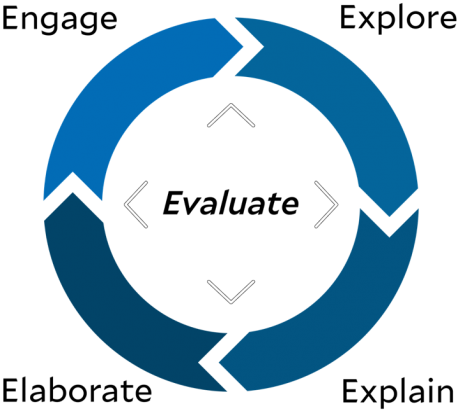 Course design frameworks provide models for achieving learning outcomes in overall courses, crafting the syllabus, and course redesign. Many elements in course design can also be applied to individual class design. Backward Design originated with Wiggins and McTighe in their book Understanding by Design (2005), and drives the educational philosophy behind most recent teaching and learning frameworks. Backward Design differs from classic beginning-to-end approaches to instructional design where the instructor first decides what content to teach before developing activities and assessments for the resulting learning. Backward Design instead begins with desired end goals by focusing on what the learner will learn, rather than what the teacher will teach. In this sense, Backward Design is a student-centered approach. In summary, a course developed using Backward Design practices alignment between learning goals, class activities and class assessments. It is well supported by learning theory. It improves attainment of desired learning outcomes. It is a well-known and widely accepted approach to course design. It is easy to remember and explain. It is transferable to almost any instructional situation. In summary, Integrated Course Design provides a detailed model for executing a Backward Designed-course that includes consideration of environmental and contextual factors impacting student learning. Instructors may choose this framework to facilitate Backward Design in their courses while including considerations of inclusivity and faculty-student assessment throughout term. Class design frameworks provide models for achieving learning outcomes in individual class sessions, developing activities, and motivating students. 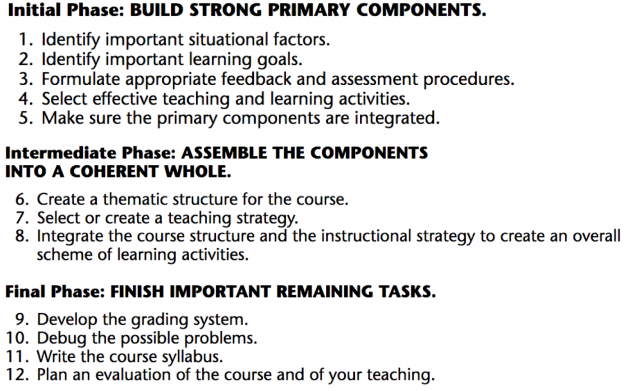 Some frameworks, like Universal Design for Learning, can also apply to course design. The 5E model was developed by the Biological Sciences Curriculum Study. The approach has been typically used in the sciences, but its principles can be applied to other disciplines (BSCS, 2001). 5E provides a 5-step approach for designing individual lesson plans or class sessions: engagement, exploration, explanation, elaboration, and evaluation, which occurs throughout the cycle. Like many modern instructional frameworks, this approach is based in constructivist theory, wherein students learn by experiencing phenomena and reflecting upon their learning. During the first five minutes of class, the instructor uses an activity that engages students in learning and builds upon their prior knowledge. The following steps scaffold new learning in ways that ascend Bloom’s taxonomy, moving from understanding to articulating and developing. At the end of class, the students might be tasked with assessing their own understanding, and the instructor may evaluate the learners on key skills and/or concepts. Instructors may choose this model for its scaffolding approach, prioritization of student learning, and flexibility to occur once or multiple times within a single class session. 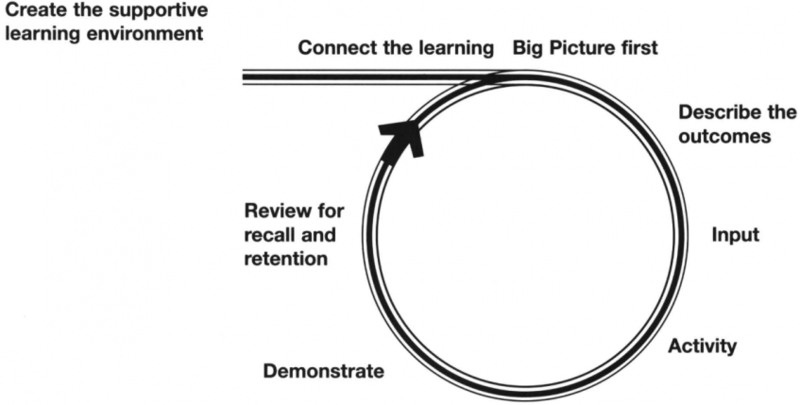 The Accelerated Learning Cycle was developed by Alistair Smith (Smith, 1996). Like 5E, it can be used to structure single class sessions. Accelerated Learning draws from Howard Gardner’s theory of multiple intelligences by building a classroom that acknowledges varied prior knowledge and learning habits. The model has several stages: the instructor creates a safe and welcoming learning environment, builds on the background knowledge of the learners to create a larger contextual framework, describes intended learning outcomes, provides new information or content, facilitates a student activity, enables discussion or interactive demonstration based on the findings of the activity, and reviews and reinforces presented information. Through these steps, ALC prioritizes “the needs of the learner” while “help(ing) students understand their own learning preferences better” (Smith 1996). 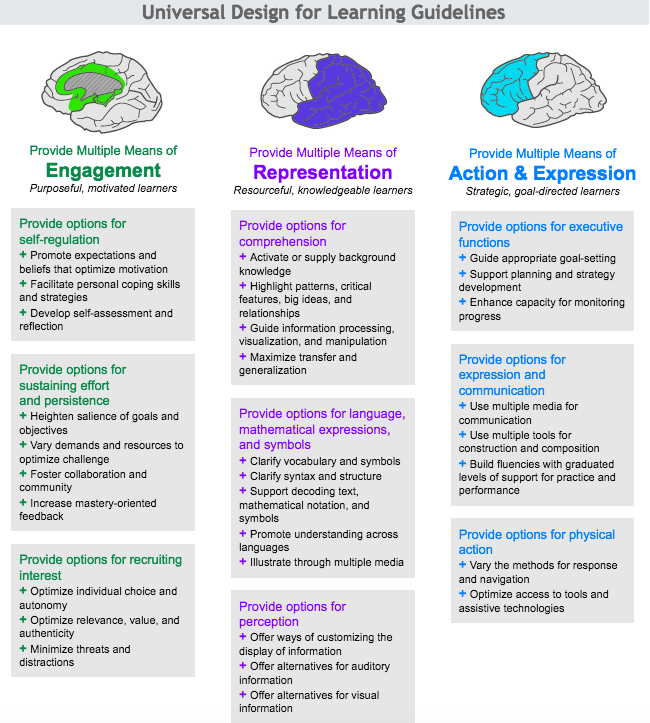 Instructors may choose to incorporate UDL for its strategies on inclusivity and access, and for its wide-ranging recommendations for revising and varying teaching approaches. UDL provides “a sufficiently flexible curriculum so that each learner can find the right balance of challenge and support” (Meyer et al., 2014). The approach has classically been understood to improve environments for learners with disabilities, but its principles apply more broadly for creating inclusive classroom settings. Identify Most Relevant Framework – Applicability of teaching and learning frameworks will depend on a host of variables, including teaching philosophy, classroom environment, course objectives, student demographics, and challenges to teaching. Instructors can consider which elements from which frameworks are most relevant and helpful for use in their classrooms. Create a Course Alignment Map - Instructors can create a map as illustrated in the figures above when designing a course. Doing so encourages instructors to align all items with the learning outcomes of the course, avoiding more instructor-centered approaches to course development. Assess Student Knowledge – Ascertaining prior knowledge and skills helps instructors craft a learning arc that fits and challenges specific student representations. Review syllabi from prerequisite courses in order to gauge likely student knowledge and recent reading; ask students to share their strengths and weaknesses anonymously on index cards the first day of class, or in an online survey before class; perform group brainstorming or focused keyword activities to uncover student knowledge. Include Formative and Summative Assessments - Formative assessments help instructors monitor the progression of students towards achieving learning outcomes and modify instruction as needed. Summative assessments are performed for the sake of accountability. As each of these types of assessments serve specific purposes, both should be included within alignment maps. Complete a Teaching Practices Inventory – Completing an inventory can help instructors identify their teaching habits, and explore the best frameworks for facilitating development of new habits, approaches, and course designs. A variety of inventories exist to describe instructors’ typical teaching approaches, many of which are short and self-driven. The “Downloads” section at the bottom of this page also contains an assessment for considering degrees of inclusivity in syllabus and course design. Modify Activities and Assessments as Needed - If students do not appear to be reaching the learning outcomes as desired, instructors can use feedback from the assessments and observations to reflect upon why this is the case. Activities and assessments may need to be modified to better prepare students to meet the outcomes. Barr, R. & Tagg, J. (1995). From Teaching to Learning – A New Paradigm for Undergraduate Education. Change, 27.6: 12-26. Biological Sciences Curriculum Study. (2001). The BSCS Story: A History of the Biological Sciences Curriculum Study edited by Laura Engleman, Colorado Springs: BSCS, 2001. Meyer, A., Rose, D., & Gordon, D. (2014). Universal Design for Learning: Theory and Practice. Wakefield, MA: CAST Professional Publishing. Smith, A. (1996). Introduction – What is Accelerated Learning? Accelerated Learning in the Classroom. New York: Bloomsbury, 1-12. —. (1996). Accelerated learning in the classroom. School effectiveness series. Stafford; Williston, VT: Network Educational Press.